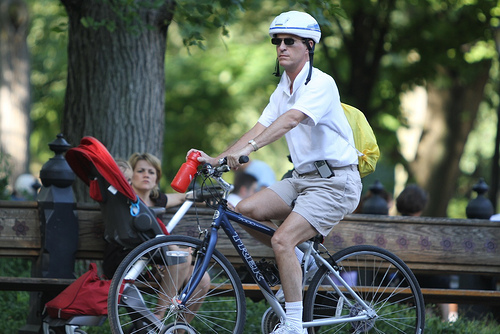 While at first glance everything seems wrong with this cyclist, I can’t help but love him. I spotted him riding in New York’s Central Park this spring and my heart went out to him. Unstrapped (1982) helmet, yellow “backpack,” high white socks, vintage PDA on the hip. Awesome. If you ever wanted to ride with an anti-style, this is how to do it.